If you don’t know what a ‘catfish’ scam is, visit my earlier blog article, How to Spot a Catfish. 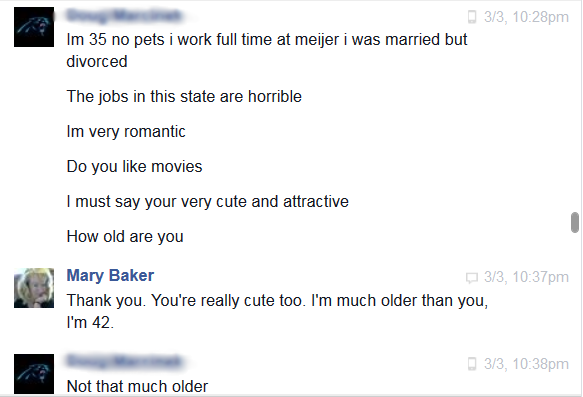 In this article, I’m going to lay out for you how a catfishing conversation usually goes, and I am going to show you actual screenshots of someone trying to catfish me on Facebook. I’m blurring out the name and photo so as not to run afoul of Facebook’s Terms of Service. Here’s how these conversations start. First, a new “friend” on your Facebook page sends you a private message. Hi, they say. Or hello, beautiful. Nothing substantive. When you respond, they flirt and compliment you a little. Then they move directly to taking you to a phone conversation. 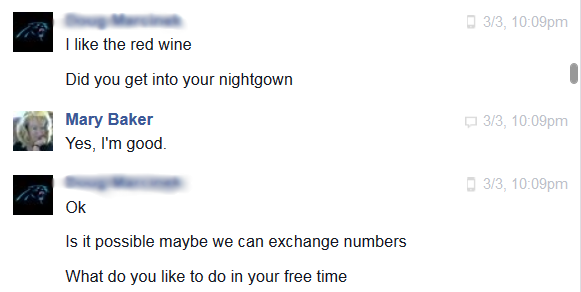 This real conversation with a catfish lasted two hours, from 9.40 pm Pacific time to 11.40 pm. I didn’t think he was very good at catfishing–he started off the conversation by complaining of a stomach ache, which of course is not exactly romantic and not at all alluring. But I figured if he wasn’t very good, maybe he wouldn’t sniff out that I’m a fake, too! Within 20 minutes, he asked if I was single, and in 28 minutes, he asked for my phone number—and he was persistent throughout the rest of the call, even when I said I was uncomfortable about that. He also supplied his own number and wanted me to call. I refused of course, but I was coy about it. I had every intention of uncovering his fishiness, but drew the line at giving him access to my phone. Indeed, about halfway through I had to take a break because the whole situation was making me nauseous. However, if I’d had a burner phone available, I probably would have gone for it. Maybe next time, so stay tuned! If you do speak on the phone, you’ll notice he has a foreign accent. He will tell you that he is an American citizen, but was born in another country and got his accent from his parents and childhood. That’s because these people are not in the United States. Even though the number he supplied is an Illinois phone number (he claims to live in Schaumburg) I guarantee these people are not in the U.S. Anyone can get a free or cheap U.S. phone number through online services and applications. So we chatted and flirted for awhile, and he began clearly trying to move me to a phone, where he can compliment my voice and cultivate a more personal connection. And of course, the issue of age will come up. He seems forthcoming here, but what he really wants is for me to reveal my age so he knows how to position himself, demographically speaking. Older women are perfect targets because they’re generally financially secure, yet digitally naive. In an ordinary catfish scam, he’ll woo you for awhile, calling often, and let you think you’re extending the first invitation for a meet. He will enthusiastically agree to meet with you. By that time, he’s calling you honey and sweetheart and sending you love letters that he stole off the web. But whenever you try to meet, he will be experiencing some disaster that requires him to ask you for a loan or advance to get him out of his pickle and into your loving arms. After you send the money, there will be yet another crisis that prevents him from actually coming. And this cycle will perpetuate for as long as you keep sending money. Here’s an interesting side note: there actually is a 35-year-old man in Schaumburg, IL with this name. He’s a good-looking boxing coach. But the photo they’re using for this fake account is a pale, anemic guy with long limp hair who looks like a gamer that’s been living in his mother’s basement for 17 years. The next morning I decided to ramp up the conversation. I picked a city 2 hours away from him and said I would be there in 2 weeks for a writers’ convention. I figured that would give him an opportunity to say, oh I can’t my car broke down I need money to fix it. But he didn’t. All he said was, “oh”. And I haven’t heard from him again. Like I said, he’s not a very good catfish. He clearly needs more practice. Just make sure he doesn’t practice his new skill set on you! I think the term started as a verb, as in “hooking a catfish” but it’s now applied to the scammers as a noun — the scammers are now referred to as “catfish”. These scammers troll the internet like fishermen with big nets, looking for lonely hearts willing to pay out big bucks to finally meet their true love. Men and women have been known to send hundreds of thousands of dollars, even millions, to catfish. There was a reality TV show about catfishing, and a 2010 B-roll film. But for the shortest, most to-the-point tutorials, just Google “Dr. Phil catfish”. The Dr. Phil show has featured multiple victims of both sexes, including one woman who paid $1.4 million to her online lover. If a stranger sends you a PM (personal message) complimenting you on your smile, your hair, your beauty, yada yada, please for the sake of all the kind, generous people out there who are targeted by these predators, report them. Don’t just block them — report them! It takes less than 10 seconds to scan a profile and spot a catfish. And only a few more seconds to report it. How can you tell if someone is catfishing? The account page will be relatively new. There will be little information and few photos. The photos that are there will have no commentary. There will be few or no posts in the status feed. What posts are there are usually bait copied from other sites. Usually missing a banner photo. The poster has really poor and awkward English. If they’re posing as men, the account will claim to be either in the US military stationed overseas, an engineer or ‘self-employed’ in Europe. Job descriptions may vary, but not by much. If the account is posing as a woman, she will be svelte, lovely, and lonely. These people never take the time to post on your status feed and engage in real conversation with you and your followers. They want to take you directly to private flirting. Facebook’s reporting structure for this kind of trolling, baiting and scamming is minimal at best. The site is attracting this kind of activity because there are no limits and no consequences. Please do what you can to make Facebook more aware of the problem and to help Facebook become a site that we can all enjoy safely. "Love, love, love the website. Thank you so much!" "Mary, I just read the new website content and I LOVE it!!!!! Well done!! I also need three more business plans for the resort, grass fed beef operation, and equestrian center." "Great forensic journalism, Mary. Nicely done." --Rick Henderson, Managing Editor of the Carolina Journal, commenting on my Catfish article "Anatomy of a Catfish Conversation"
Post-Election: Can Blue Voters Reach Out to the Red Rebellion?